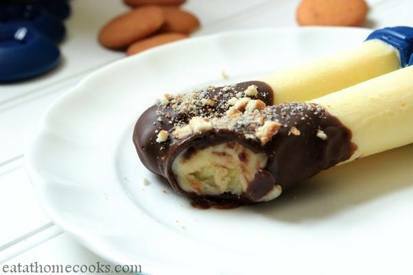 Chocolate dipped banana pudding pops!! These Chocolate Dipped Banana Pudding Pops have become one of my recent “go-to” snacks and they’re so easy to make. I've always been a fan of Popsicle. I remember having the molds as a kid and making Popsicle with anything I could get my hands on. I love banana pudding and the combination of chocolate and banana is just the perfect match, so it was only a matter of time before I combined them together into this frozen treat.